You will probably already know the Saucy Fish Co and their packs of fish with ready-made sauces. Well they've just launched a new line of salmon - this time it comes already cooked and alongside a variety of dressings. They sent me some to try out. With almost a quarter of the nation not knowing how to cook and prepare fish, the Saucy Fish Co says that it offers a stress-free solution to get fish into your diet. Their existing range of raw fish comes alongside a sauce and clear instructions on how to cook it. 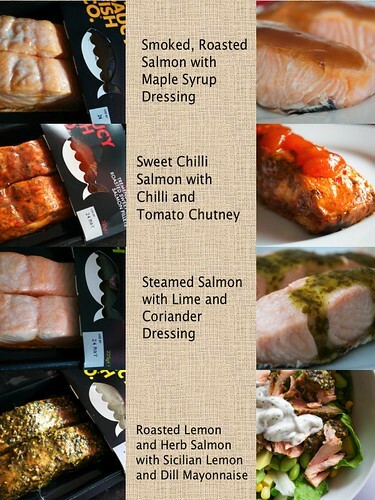 And for summer, they've launched a range of cooked salmon products that they say are great for eating with salads or for picnics. Some of them I tried were very unusual (at least for me). The maple dressing was sweet which I thought was a bit weird alongside salmon, but out of the four I tried, this was the one the girls liked the most. The sweet chilli salmon with the chilli and tomato chutney was by far my favourite - a hum of heat and the rich chutney paired well with the marinated fish. 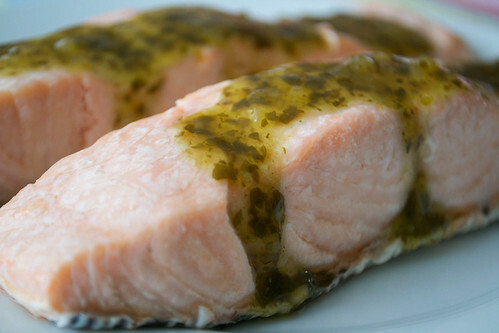 The steamed salmon with lime and coriander dressing was zesty and cut through the richness of the salmon really well. And with the roasted lemon and herb salmon, which came with a lemon and dill mayonnaise, I made a salad. To be honest, this was my least favourite: the herbs tasted sweet with the fish and I preferred it without the mayonnaise, which I felt wasn't really needed with all those herbs already on it. I'm not a huge fan of eating cold fish just as it is but you could also flake it up and fill sandwiches with it, break it up into tarts (like this one) or make salmon paté, like I did (below). 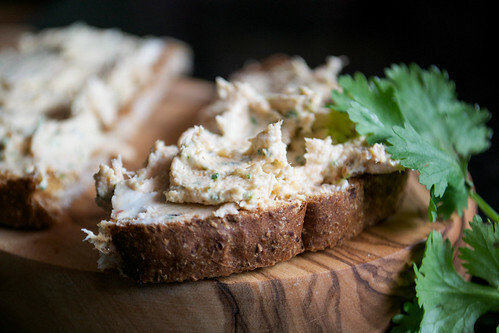 This paté takes just a couple of minutes to blitz together. The sweet chilli salmon gives a gentle heat while the lime and coriander add fragrance and freshness. Blitz the soft cheese, cooked salmon fillet, coriander leaves and lime juice in a processor until smooth and blended together. Taste and add a pinch of salt and more lime juice or coriander if needed. Serve on wholemeal toast.